EasySept Discount Package - 6 months - Weblens - Your Contactlenses Online ! Single-phase hydrogen peroxide treatment system from Bausch + Lomb. For deep and thorough cleaning, suitable for soft lenses. In this package are 5x360ml + 5 lens holders with neutralization stone + 1x355ml salt solution. EasySept peroxide contact lens fluid is a 1 phase peroxide system. The 3% hydrogen peroxide liquid acts as a disinfectant for all microorganisms and guarantees perfect cleaning after six hours of soaking. Although the liquid is hard for bacteria, it is soft for your lenses. Safe to use with all soft weekly, two-week or monthly lenses. 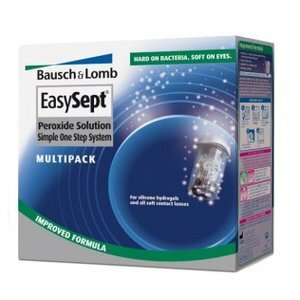 EasySept peroxide contact lens care system is provided with an improved lens holder. This is easier to use and also leak-proof!